A healthy eye-care routine sometimes calls for eye drops to help fight infection, promote healing, or simply to provide hydration and comfort for dry, tired eyes. Most drops are designed to take effect immediately upon contact with the eyeball, hence the benefit of applying them topically, as opposed to orally prescribed medications. But applying drops is not without its hassles. Many people find applying drops uncomfortable, or even impossible, and there is usually some slight mess associated with the process. Let’s break it down, and find out more about the types of eye drops, their benefits, and strategies for easy application. Your eye doctor or pharmacist may have prescribed pharmaceutical or over-the-counter drops for you to help with glaucoma, conjunctivitis, chronic dry eyes, or a number of other conditions. Glaucoma treatment may require the use of more than one type of eye drops, and if this is the case, be sure to pay attention to your provider’s in­structions for use, as there may be a necessary order in which you will need to apply the drops, or at a certain time(s) of day. Conjunctivitis (also known as pink eye) is a bacterial infection that is usually treated with antibiotic eye drops. You’ll be cautioned by your eye-care practitioner to avoid wearing contact lenses while your eyes fight this common infection. Discomfort caused by seasonal allergies can often be eliminated with antihistamine allergy eye drops. Pollen, dust, and pet dander can also lead to itchy, red, and watery eyes. Your pharmacist can recommend appropriate eye drops for itchy eyes, redness, or other symptoms without a prescription. Computer vision syndrome, or dry eyes caused by excessive screen time, seems unavoidable in today’s world, as most of us are attached to our smartphones, tablets, and work computers. For anyone who seems to spend most of their waking hours looking at digital screens, lubricating eye drops for dry eyes or artificial tears can help. Ask your optician for a recommendation, and then it’s often handy to keep a bottle of drops wherever you may need them – at your workstation, in the car, in your handbag or gym bag, etc. Among the best eye drops for these symptoms are Gelone lubricating and rewetting drops and Biotrue rewetting drops. 1. Wash your hands thoroughly with soap and water. Dry them with a clean, lint-free towel. 2. Remove your glasses or contact lenses, if you are wearing them, unless you are using eye drops specifically designed for contact lens wearers. 3. Tilt your head backwards, or lie down. 4. Use one hand to delicately pull your lower eyelid downwards. You want to create a small gap between your lower lid and your eyeball. 5. Point your dropper bottle downwards towards your eyeball, at a distance of about 1 inch from your eye. 6. Gently squeeze the bottle to dispense a drop into your eye. 7. With your head still tilted back, apply as many drops as indicated by your healthcare provider or the package instructions. 8. Close your eyes for a few seconds before blinking to allow the drops to be absorbed sufficiently. If you are still struggling with how to apply eye drops, don’t worry, you’re not alone. Many people find this challenging, but there are strategies to make it a little easier and more comfortable. First, practice makes perfect! If you’ve been prescribed medicinal drops, you’ll want to get the hang of it quickly so you don’t waste any product and delay your recovery and healing. Try to practice with some over-the-counter artificial tears. You can practice your technique, aim, and dispensing method without overmedicating or wasting expensive pharmaceutical drop­s. Some people also find it more comfortable to apply eye drops while lying down, instead of simply tilting the head back. And, use other tools at your disposal – a mirror or a friend. A mirror makes application a bit easier for some people, although it may be more difficult to maintain the angled head position necessary. If you find you cannot do it on your own, enlist a friend to either insert the drops for you, or help guide your hand as you get into position. Wriggling toddlers and children sometimes don’t make for the easiest patients, and as a parent, this can make caring for your kids’ eyes challenging. If your little ones are averse to eye drops, try these methods to make sure they get the remedy and relief they need. Have your child lie down. It’s easier to remain still this way, rather than while standing. Gently pull down your child’s lower eyelid, and ask him to look up. 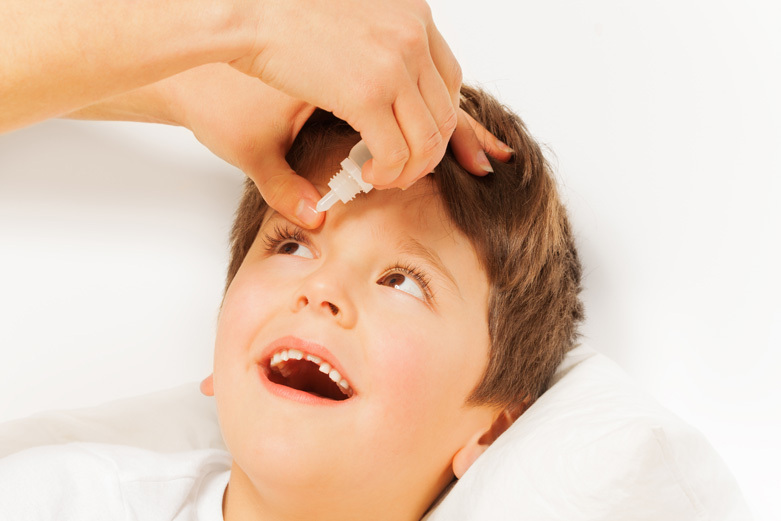 Apply the required number of drops into the gap between the lower lid and the eyeball, and ask your child to blink a few times to disperse the medication. An alternative method, although perhaps not the most effective one, is to apply eye drops into the inner corners of your child’s closed eyes while he is lying on his back. When he opens his eyes, most of the drops should run into the eyes. Ask your family’s eye-care provider for advice, if necessary. Pay attention to the expirations dates of any drops you use. Do not use drops past their viability dates. Note the recommended storage temperature of your drops. Some drops must be refrigerated, while others should be stored in a cool, dark place to protect their efficacy. 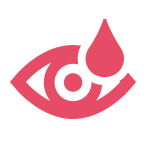 Never touch the dropper to your eye, with your fingers, or wipe it with any cloth to maintain sterility. Try hygienic and individually packaged “mono-doses” for relief from dry eyes. Simply break the plastic vial, dispense, and then discard. Mono-dose drops are available from Laim Care. Use eye drops only as prescribed by your eye-care physician, pharmacist, or as indicated in the – After applying drops, blot your damp eyes gently, being careful to avoid touching your eyeball with any tissue or cloth. Some drops can temporarily cloud or impair vision. Always check with a medical professional to find out how long you should wait before driving or operating machinery when using certain medicated drops or gel eye drops like Laim Care Gel.